Stump removal starting at $129.00! Our original STANDARD SERVICE is $7/inch for most* stumps. Our $129 minimum charge includes one stump up to 18″ as well as the required utility locate, and written service agreement. Residual mulch is left for property owners to incorporate into their landscape & gardening, or dispose of themselves to save some money! Our new COMPLETE SERVICE adds $2/inch to haul away the excess mulch for most* stumps. Our $129 minimum charge includes one stump up to 14″ as well as the required utility locate, written service agreement and appropriate clean-up with excess mulch removed and hauled away, to leave your yard with a finished look after your stump is removed. Discounts apply for additional stumps on the same lot. While many tree companies charge $10/inch diameter and have a $150-$180 minimum charge, or an additional fee for the utility locate, Flatirons Stump Removal charges 15-40% less for quality service we guarantee is as good or better, with no extra fees! - A second picture standing back showing the stump surroundings. - Is this stump in the front yard, or backyard (or side)? -Your city to be sure you’re in our service area. Flatirons is one of the only stump removal services that utilizes the Colorado 811 utility locate service as required by Colorado law. Before comparing price quotes, ensure that you, the property owner, will not be left with liability exposure for potential underground damages by using a competitor who skipping this step. Flatirons is fully insured. Proof of insurance is provided upon request. We are better! We have removed thousands of stumps, we are streamlined, thorough and efficient. It’s all we do. Satisfaction guaranteed. We have been in business for 6 years and continue to stand by our work. A written estimate, specifications** and scope of service is provided prior to beginning removal. Major credit cards, check, Venmo, Zelle, and of course cash accepted. The number of inches across the base is the number we need. Stumps are a little like icebergs with more below the surface than above. 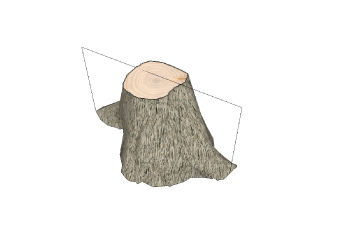 For a more accurate estimate, measure your stump at the widest point where it intersects with the ground – “root flair to root flair.” When providing us with information on the size of stump being ground or removed, you should measure at the base of the stump as shown in the illustration below.